We have a large selection of awards for your tennis events. We have traditional tennis trophies. We also have tennis letter pins. 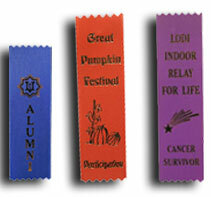 We even offer custom and stock ribbons and rosettes. To view any of our tennis products, just click one of the links below. You'll find a number of tennis trophy designs. If you're looking to purchase a tennis trophy, click on the link below. You pick select the tennis figure you prefer, and then choose the style of trophy you would like. On most tennis trophy figure pages we have four or five trophies that may be purchased on that page with that figure. On these trophies we will use the base and column colors we have on hand. This is the most economical and easiest way to purchase your tennis awards. If you are looking something a little different, we have the acrylic tennis ice awards. They come in three styles. The block ice is available in three sizes. The star and flame ice tennis awards are available in two size options. To check these awesome awards out, just click the link below. You pick the style and size, and select the 2" Mylar insert which you would like. Our tennis medals are an inexpensive way to reward your players. Most come in gold, silver or bronze. They can be engraved for $.07 a character. The medal comes with a 7/8" x 30" neck ribbon. You can select your medal without a neck ribbon, or with a wider 1" x 30" ribbon, pin drape and presentation box. You will also be sure to check out our resin tennis statues. They are available in both male and female or non-gender design. Tennis trophy statues are a great award for all tennis matches and competitions. Visit all the links below to see the tennis trophies and awards from H & R Trophies. Orders ship in five to seven business days. If you need your order sooner, we have rush service available and special shipping is also an option. The image and resin plaques, resin statues, trophies and ice awards all come with 40 characters of FREE engraving.